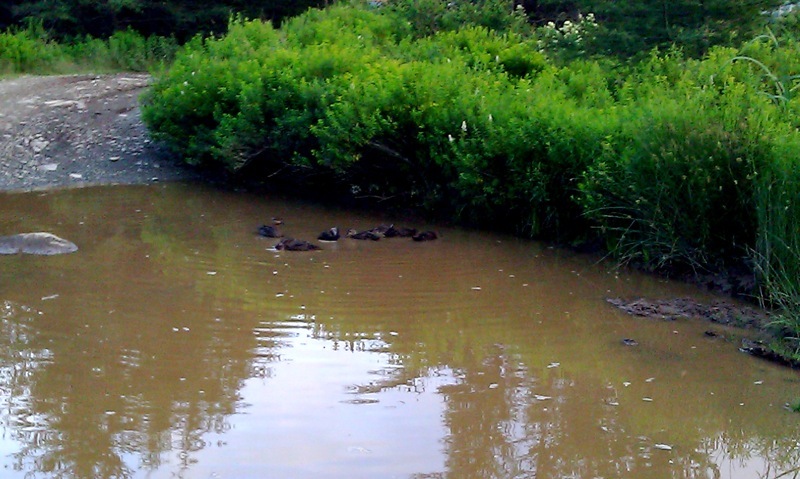 This afternoon we noticed a small commotion along the side of the house when a small family of ducklings decided to huddle up and cry for their mother to find them. 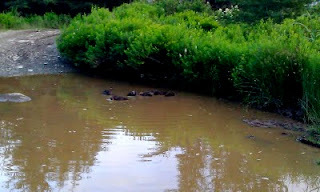 Being a fare ways away from any form of pond or lake, this was very concerning -- we have a lot of cats in the neighborhood and the ducklings wouldn't stand a chance if they were found. So the next two hours were filled with calls to wildlife dept and the SPCA, the later of which were very helpful dispatching two volunteers with a carrier to collect the ducks and attempt to relocate them. Upon arriving the SPCA volunteers gathered the ducklings from underneath laundry baskets we & our neighbors had used to shield them from cats, then we all began looking for a safe place to deposit them. 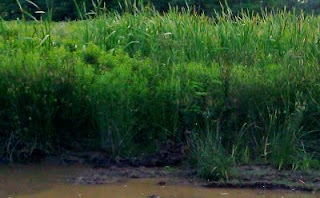 Walking the pole line behind the house we came near to the bog land near the highway. 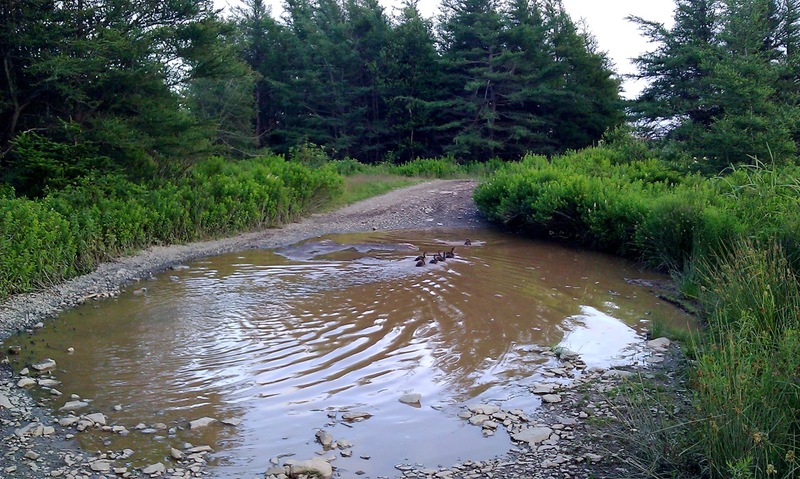 We discussed if these wet lands would be suitable for the birds or if we'd have to transport them to long pond or bowring park when above our heads the mother duck came swooping. We immediately opened the carrier and the ducklings and mother raced to meet again. Pictures of the happy reunion are below. 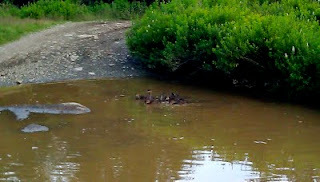 Mother and her seven ducklings reuniting. Mother duck marching her charges into the bog lands. My neighbors' have a few pictures of the ducklings in the laundry baskets while we were trying to contact the wildlife dept & the SPCA. I'll add those photos to this story once I have copies. The third maintenance release of the Apache Karaf 2.2.x branch has entered the planning phase, as such I'm preparing for the release management role. Unfortunately I can't share the wine with you, but I can share a few links to Plaskett videos. I'm looking forward to starting the 2.2.3 release process. I'll be posting updates to our Twitter stream (#karaf) and on our IRC channel (irc.codehaus.org #karaf). 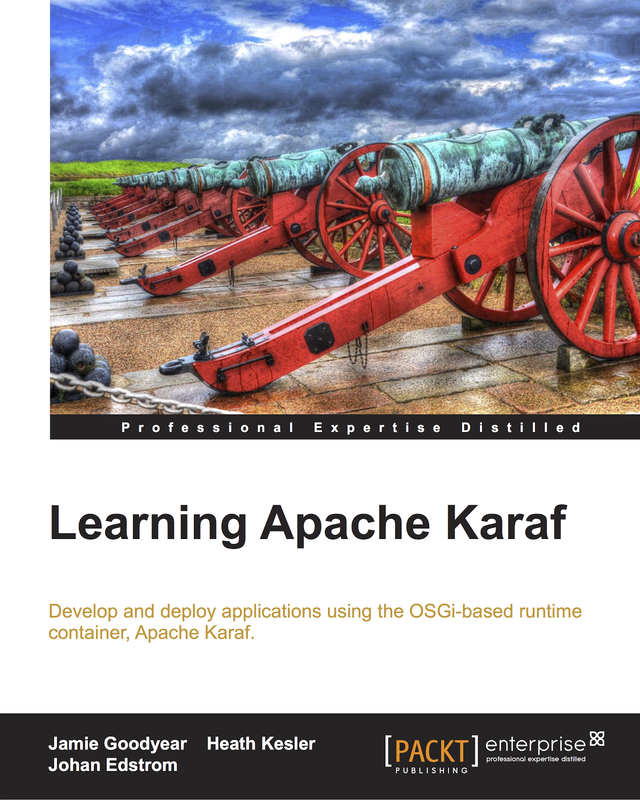 Marking the last planned release for the 2.1.x branch, the Karaf team is pleased to announce the availability of Apache Karaf 2.1.6. This release of Apache Karaf is based off of the 2.1.x series branch, representing an update to Apache Karaf 2.1.5. It contains a few small bug fixes and improvements, including; updated branding-console documentation, a new warning on osgi:shutdown to avoid inadvertently shutting down the container, and a correction to the Oracle JDBC locking mechanism behavior when the locking table is empty. As discussed in my prior Apache Karaf 2.1.6 preparation post, I've taken in the Wreckhouse International Jazz and Blues Festival the last few days, and have sampled the François Pélissié Croix du Mayne Cahors 2008. I think that was a fitting end for such a great line of Apache Karaf. The source code is of course still available, and anyone needing to access it may find it in our SCM. I'd like to take this time to thanks all of our contributors and users for all of their efforts and support during this branch. During it's time we've seen a major up swing in Karaf's adoption, with download rates steadily climbing. I look forward to enjoying even more successes with our community as Karaf 2.2.x and 3.x continue forward. The final planned release of the Apache Karaf 2.1.x branch is now under way. As the release manager I've had to prepare a little extra for the end of life for this line. 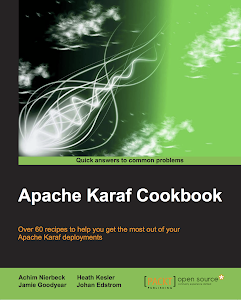 Preparing for the Apache Karaf 2.1.6 release. To prepare I've selected François Pélissié Croix du Mayne Cahors 2008 to decant while taking in the Wreckhouse International Jazz and Blues festival here in St John's Newfoundland. The combination of smooth jazz and strong red wines seem to pair nicely to celebrate the efforts that's gone into making the 2.1.x line. The wine will of course be sampled after being gave proper time to breath in its container, after the first release candidate has been loaded up for voting (see our release guide for more details on our process). 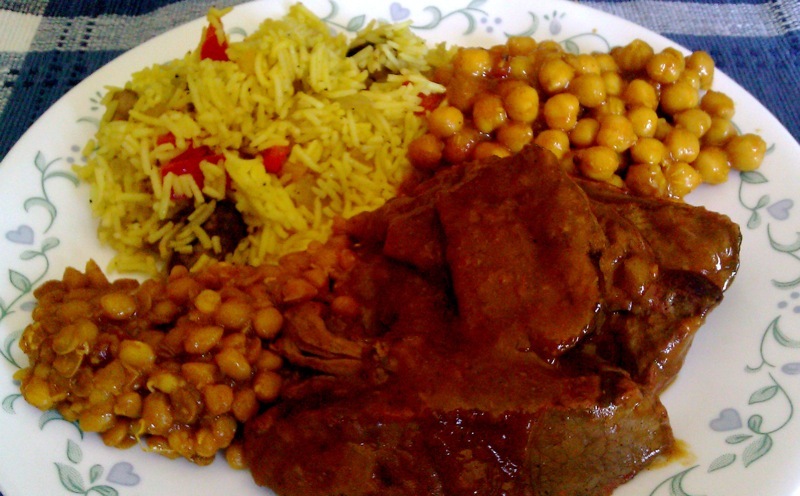 Basmati rice, Madras Chickpeas & Lentils, and Beef Rogan Josh. 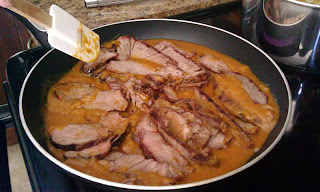 The basmati rice was a simple combination of powdered curry, garlic, & cumin with onions, mushrooms, and mixed peppers. The Madras chickpeas and lentils were standard fare - just the legume in sauce, slowly heated until delicious. Finally, the Rogan Josh beef was a simple stack of steaks BBQed until medium rare, then sautéed in rogan josh sauce until it became thick like gravy. Java early access builds of JDK7 are now available for download, as such I thought I would get a copy and take it out for a test drive. JDK 7 for 64 Bit Linux. OS name: "linux", version: "2.6.38-8-generic", arch: "amd64", family: "unix"
Once subversion was present I checked out the latest code from trunk, and was ready to start testing out the new JDK. Starting from a clean slate I executed mvn clean install in trunk, and watched while maven took over and started downloading all the dependencies and resources it required. Once maven was satisfied it started in compiling Karaf, module by module. The first snag encountered during the JDK7 build was with the Karaf JAAS module. The Felix Properties call get (key) and keySet now both require explicit type casting on their return values. A few simple casts, and we were back in business. More explicit casting was required in Karaf Admin Core and Karaf Maven Plugin. Correcting these minor issues Karaf was able to completely build. Unfortunately many of the integration tests fail. I suspect some failures are due to new security provider configurations, while others are due to dependencies not being fully JDK7 compliant at this point in time. Continuing on, I tried out the Karaf kit produced by the build attempt. The issues encountered above however prevented Karaf from fully starting. It appears that we'll be working towards a stable JDK7 build of Apache Karaf for the next while. On the bright side of things most of the Karaf code base is now compiling under JDK7, so our efforts here will probably shift towards assisting the underlying projects to become JDK7 compliant then return to Karaf to see how they integrate into the whole. Another walk on the East Coast Trail, this time Sugarloaf Path. I thought I'd share some more photos of the landscape here Newfoundland. We don't get too many sunny days, so when we do have one we tend to get out and enjoy our great outdoors. Looking over the cliff edge to the ocean below. The Apache Karaf team is pleased to announce the availability of Apache Karaf 2.2.2. This release of Apache Karaf is based off of the 2.2.x series branch, representing an update to Apache Karaf 2.2.1. It contains bug fixes identified in the prior release, and introduces improvements including; improved behavior for the OracleDB locking mechanism and http feature jetty port usage. 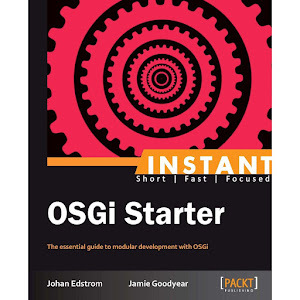 Several improvements to the shell have been incorporated, such as completion for shell aliases and a warning on osgi:shutdown to avoid inadvertently shutting down the container. There has also been a few small dependency upgrades to felix event admin, Pax URL, and jetty. For more detail please see the change log below.